Cornerstone Cleaning Services, LLC is a commercial and residential cleaning service. We specialize in cleaning offices services include high and low dusting, floor maintenance, and dazzlingly clean bathrooms. We pride ourselves on integrity and hard work. Cornerstone chooses people who share the values and vision of the organization. We are excellent and want our customers to experience the Cornerstone difference. The Cornerstone difference is letting our values of integrity, excellence and personal responsibility. This combination of items allows for a consistently clean home after each visit, that is the Cornerstone difference. Cornerstone Cleaning Services, LLC is a commercial and residential cleaning service who can help you make moving just a little easier. Preparing to move can be a daunting and overwhelming task for everyone. Breaking down a home and the memories make in your home is hard work. After sorting through your belongings, packing boxes and loading a truck – YOU AND YOUR FAMILY DESERVE A BREAK! That is where Cornerstone Cleaning Services can help. While you and your family kick back and enjoy a day in the city Cornerstone can be hard at work helping you to prepare to sell your home. 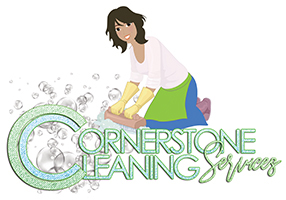 One of the most frequently asked questions that we receive is “ How Much Does Move Out Cleaning Cost ?” This is a multi-tiered response and luckily Cornerstone Cleaning Services is here with an answer. When a family moves out of a home there are several things that are required to happen, one of which is a deep clean of the home. No matter how tidy (or untidy) a home’s condition ensuring that it’s in tip top shape for viewings for potential buyers or preparation for the next tenant is important. Cornerstone can help. In addition, All appliances are cleaned (normally $35 per appliance), patio and garage are cleaned and wax applied to all floors. After you have done the hard work, let Cornerstone Cleaning Services do the dirty work!